Attorney General Jeff Sessions said the Justice Department may investigate Internet companies’ news policies as well as their bans of controversial voices. Plenty of legal scholars believe there are legitimate grounds to bring federal antitrust actions against Facebook, Google, and Twitter. But to go after them for political bias, or for stifling speech? The legal world reacted with alarm to a surprise statement from US Attorney General Jeff Sessions last week that the Justice Department is considering investigating these companies over the way they present news and information and ban controversial voices from their platforms. 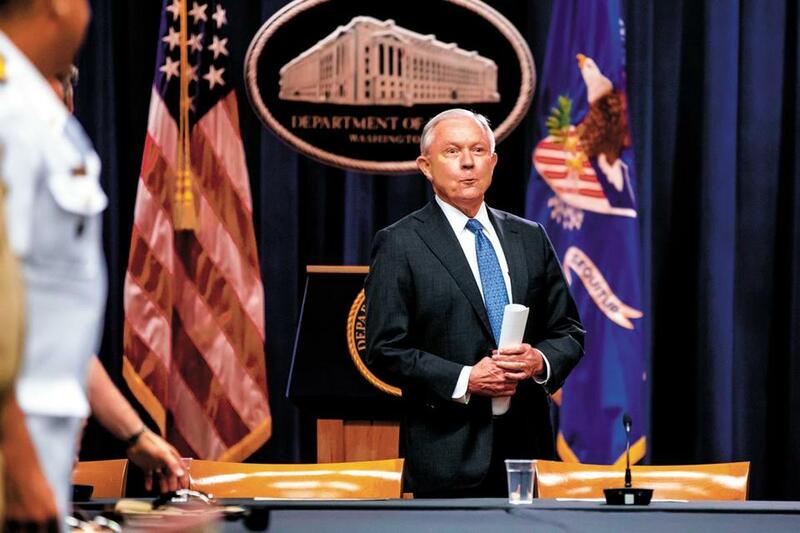 And at a left-of-center Washington think tank called Open Markets Institute, fellow Matt Stoller said that Sessions was “weaponizing” antitrust law. “We don’t think the antitrust division should be using its enforcement authority to go after political opponents of the White House,” Stoller said. Concerns about competition fall squarely under traditional antitrust law, which is supposed to prevent companies that dominate their industries from using their market power to harm consumers or to put competitors at an unfair disadvantage. In the early 2000s, the government used antitrust law to force major changes at the software titan Microsoft Corp. But it’s unclear if the Justice Department has the authority to require Internet news and information services to meet some government-defined standard of fairness. Earlier Wednesday, Facebook’s chief operating officer, Sheryl Sandberg, and Jack Dorsey, the chief executive of Twitter, testified before the Senate Intelligence Committee on the threat to US elections posed by Russia and other foreign actors. But lawmakers also addressed a litany of complaints from conservative political activists — that Facebook, Twitter, and the giant search service Google are run by avid liberals who suppress news, opinions, and other information with a conservative slant. The issue first gained national attention in 2016, when the online publication Gizmodo reported that news editors at Facebook suppressed stories from conservative news sources. Since then, conservative critics have made similar claims, though none has provided proof of a deliberate effort to stifle their views. President Trump recently cited a report from a conservative website, PJ Media, that claimed 96 percent of news stories on Google News were from sources with a “left-wing” bias. “Google & others are suppressing voices of Conservatives and hiding information and news that is good,” Trump wrote. Many critics of the Internet giants say there’s good reason to launch antitrust probes of Facebook and Google, companies that dominate multiple markets, including social media, search, e-mail, messaging, and advertising. “The problem with Facebook and Google is that they’re running institutions that billions of people are using, and that’s too big,” said Stoller, who favors breaking up the Internet giants. Like Stoller, Tim Wu, a professor of law at Columbia University, believes Google and Facebook should be broken up because their sheer size scares off potential competitors, stifling innovation in every market these companies touch. “The president indicating that he’s not averse to an antitrust investigation gives the Justice Department and the antitrust division considerable leeway,” said Wu, author of the forthcoming book “The Curse of Bigness,” which calls for a court-ordered breakup of Facebook, Google, and Amazon. Meanwhile, more-conservative thinkers like Samples of the Cato Institute argue against legal action, because, they say, there’s little evidence consumers are being harmed, especially when almost all of the companies’s products and services are given away at no charge. Moreover, they still face meaningful competition: Microsoft’s Bing search engine, for example, offers a high-quality alternative to Google’s. But on the matter of Internet “media bias,” there appears to be universal unease among scholars about the prospect of government intervention. Internet law specialist Eugene Volokh, a professor of law at the University of California Los Angeles, said the government has no legal basis on which to investigate — certainly not the antitrust laws, which say nothing about restricting media bias. “If they’re going to be talking about enforcing existing laws . . . well I don’t think there are such existing laws,” Volokh said. Wu said it might be necessary to pass legislation similar to the now-defunct Fairness Doctrine, which required radio and television broadcasters to provide equal time to opposing points of view. In practice, this led many stations to avoid broadcasting partisan programming of any kind. Abolition of the Fairness Doctrine during the Reagan administration was widely considered a boon to conservatives, allowing stations to offer radio shows such as Rush Limbaugh’s program without providing equal time to liberal broadcasters with lower ratings. Texas GOP Senator Ted Cruz has taken aim at a legal protection Internet companies currently enjoy: the Communications Decency Act (CDA), which shields them from liability for materials their users publish. Without the CDA shield, Facebook and similar companies could be sued for libel whenever a user posts false information — and risk being driven out of business. Harold Feld, senior vice president of the digital advocacy group Public Knowledge, said breaking up the Internet giants could reduce online bias without a Fairness Doctrine, because it might spawn increased competition that produces a more diverse social media world.